Let friends and family know you've met your Prince Charming and soon you will both be saying yes to happily ever after. 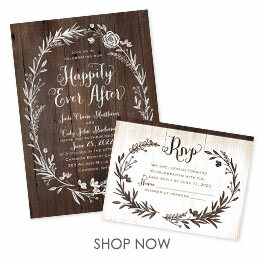 This fairy-tale wedding invitation features a heartwarming quotation above your wording. The quotation is printed as shown in your choice of color. Your wording is printed in your choice of colors and fonts. Invitation includes outer envelopes. Matching enclosures are printed on non-folding cards and are sold separately. Personalization Options: Design is printed as shown in your choice of color. Your wording is printed in your choice of colors and fonts. We are paying for our own wedding. Budget is a big issue. We wanted quality but still needed to keep in our budget. 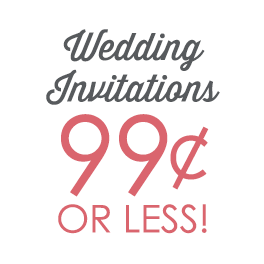 Thankfully we found the perfect invitations to fit our personalities and budget. They were also delivered so quickly! These invitations were perfect. With the response card and a piece of paper with hotel/directions we only had to use one .49cent stamp on the outside envelope. We were well under the ounce weight limit from the post office. They came out beautiful....love them!! Only wish there were more colors to choose for some of the wording. 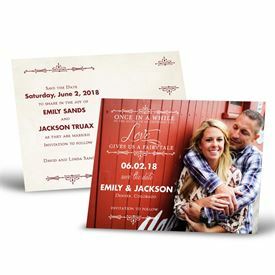 I ordered the invitations, they were PERFECT, quick shipping and packaged well I also ordered the napkins they were also PERFECT, what a great price, Thank you !!!!!!! I was unsure of ordering a product on-line of such importance that I could not view in real time. I like to handle a product and go over it with a "fine tooth comb" so to speak, looking for flaws. But my daughter urged me to it, having heard positive remarks about it from another source. So I did and am glad. I am pleased with the invitations. They arrived in the mail unharmed, intact.